Description: Grand early town plan of Chester from the very first atlas of city plans "Civitates Orbis Terrarum" by Georg Braun and Franz Hogenberg, published between 1572-1617. Latin description of Chester on verso. Superb original colour. Description: Whimsical county map covering the area of Cheshire. Taken from Michael Drayton's allegorical poem of England and Wales "Poly Olbion". Charming map illustrated with nymphs, royalty and peasants. Coloured. Title: : The Countye Palatine of Chester with that most ancient citie described. Description: Cheshire. A fine map of the county from the second edition of Speed's seminal atlas, 'The Theatre of Great Britaine'. Vignette of Chester. Description: Miniature copper-engraved bird's eye view of Chester, with Medusa in the foreground. Coloured. Description: Attractive county map of Cheshire. Decorative cartouche and compass rose. Great impression. Description: Decorative Dutch Golden Age map of Cheshire. Latin text on verso. Original hand colour. 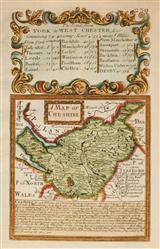 Description: County map of Cheshire based on the surveys of Speed and Saxton but printed at the time of Charles II. Description: County map. Cartouche and text. Coloured. Description: County map. Illustrated borders show antiquities found in area. Coloured. Description: Cheshire, highlighting cities and towns and with a decorative cartouche. Coloured. Description: County map. Fine large scale map set within text panels. Very good detail. Original colour. Description: Unusual county map in original colour with a panel of descriptive text below. Description: Attractive copper-engraved county map of Cheshire surrounded by descriptive text, a vignette of Chester Cathedral and a splendid cartouche. Original colour. Description: Cheshire. Miniature county map. Coloured. Description: Cheshire, a detailed and attractive county map published in the early 19th Century. Original colour. Description: County map of Cheshire showing the newly developed road network during the Industrial Revolution. Original hand colour.